…before the former Warchief of the Horde: Orgrim Doomhammer. 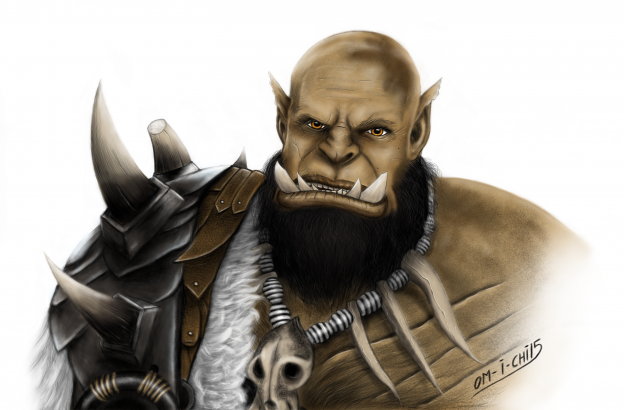 This is my digital drawing of Blizzard’s Orgrim Doomhammer (played by Robert Kazinsky), designed by WETA, from the upcoming Legendary movie „Warcraft“, directed by Duncan Jones. The movie will be great, there’s absolutely NO question about it. WETA, Legendary and Blizzard are involved – all companies known for creating art on the highest level. Dieser Beitrag wurde unter Allgemein abgelegt am 12. September 2015 von Michaela.